Goalkeeper Hope Solo of the United States in action during the game against Costa Rica at Children's Mercy Park on July 22, 2016 in Kansas City, Kansas. 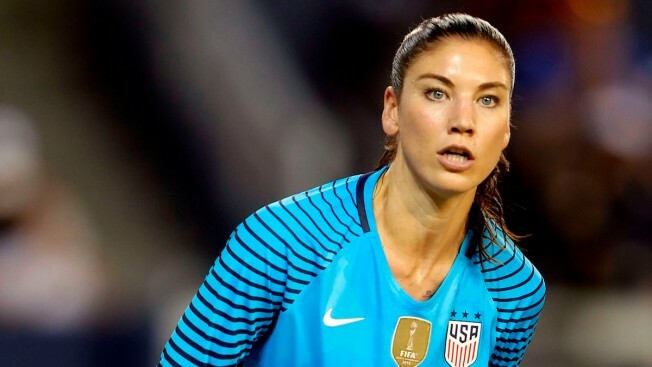 U.S. Soccer has suspended goalkeeper Hope Solo from the U.S. Women’s National Team for six months for conduct that is "counter to the organization’s principles," according to a release from the organization. The suspension for Solo, who was previously suspended for 30 days early in 2015 for her conduct, is effective immediately. “The comments by Hope Solo after the match against Sweden during the 2016 Olympics were unacceptable and do not meet the standard of conduct we require from our National Team players,” said U.S. Soccer President Sunil Gulati. “Beyond the athletic arena, and beyond the results, the Olympics celebrate and represent the ideals of fair play and respect. We expect all of our representatives to honor those principles, with no exceptions. Solo will not be eligible for selection to the U.S. Women’s National Team until February 2017. In the Olympic quarterfinals, Sweden beat the United States 4-3 on penalties following a 1-1 draw. After the loss, the attention fell on Solo for comments she made about Sweden's tactics to go on the defensive, saying she thought they were "a bunch of cowards." "We had that style of play when Pia (Sundhage) was our coach. I don't think they're going to make it far in the tournament. I think it was very cowardly," Solo said. "But, they won. They're moving on. And we're going home." Sundhage she coached the Americans for five years and won gold medals at the Beijing and London Olympics. Current U.S. coach Jill Ellis was her assistant. Solo responded to the suspension in comments to Sports Illustrated, in which she also said that her contract with U.S. Soccer had been terminated. "I could not be the player I am without being the person I am, even when I haven't made the best choices or said the right things," she said. Rich Nichols, executive director of the USWNT Players Association, told SI the organization would appeal the suspension. "We also question whether this action would ever have been taken against a male player or coach, who, in the heated moments after a frustrating defeat, questioned the tactics of the opposing team," he said.